A combination coming-of-age and life crisis drama that unfolds with spirited zeal, Scent Of A Woman rides the monstrous engine of a bravura Al Pacino performance. Charlie Simms (Chris O'Donnell) is a low key student at the preppy Baird School for boys in New England. With the Thanksgiving long weekend approaching, Charlie witnesses his friends and fellow students pulling off a prank that destroys the new Jaguar of the school's stiff headmaster, Mr. Trask (James Rebhorn). An inquiry is called for after the weekend, with Charlie likely to be in a lot of trouble if he does not reveal the identify of the pranksters. Carrying this burden, Charlie takes what he believes to be a simple weekend housesitting job to look after the blind retired Lieutenant Colonel Frank Slade (Al Pacino), a loudmouthed, opinionated and bitter man. But Frank has plans for a final hurrah in life: he sweeps Charlie along and they set out to spend a lavish weekend of luxurious eating, drinking and womanizing in New York City. As the weekend progresses, a tentative father-son relationship starts to evolve between the veteran and the student. Charlie slowly starts to realize that he is going to have a key role in Frank's weekend, while Frank learns about Charlie's troubles back at Baird. Scent Of A Woman is built for the highlight reel, and offers several outstanding moments. The first meeting between Frank and Charlie is a spectacularly unfair collision between an uncertain young man and a grizzled army veteran, the master sizing up the student for an adventure that Charlie does not even know about. 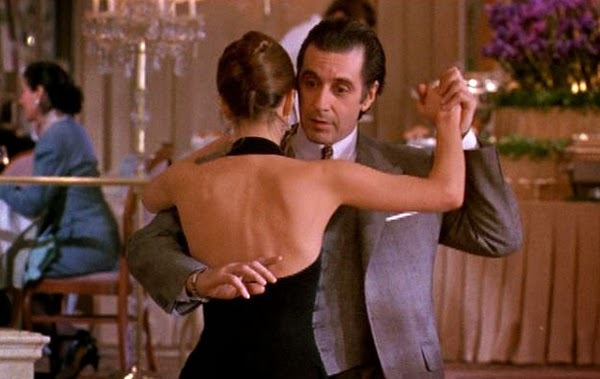 The tango sequence, from set-up to denouement, is a genuine all-time classic movie scene, bundling the meaning of life into all of about six minutes, Frank demonstrating what it means to seize the right opportunity, trust true instincts and enjoy the moment. Also memorable but starting to veer into the melodramatic are the twin climax moments, first Charlie saving Frank from his lowest ebb, paving the way for the "I'm in the dark here!" roar, then Frank returning the favour and standing up for Charlie at the formal school inquiry. That entire ending is overcooked to a carbonated mess, but there is no doubting the power in Pacino's delivery of the seminal "If I were the man I was five years ago, I'd take a FLAMETHROWER to this place!" For a movie that is essentially a study of two characters, the running time of 157 minutes is quite excessive. 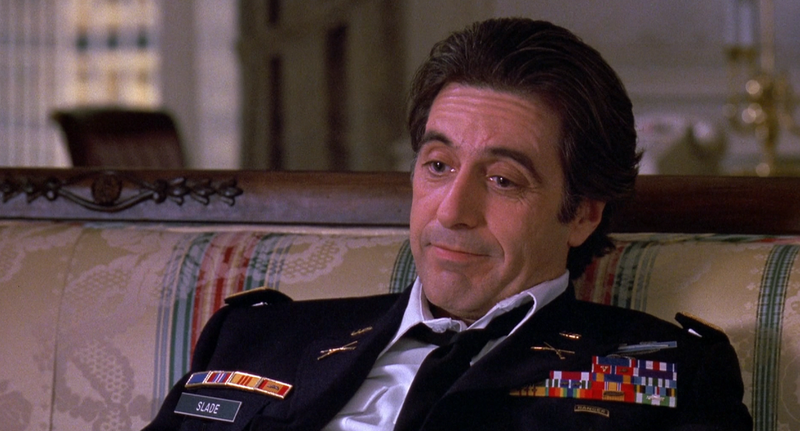 Nevertheless, director Martin Brest keeps the drama ticking along nicely, driven by an unapologetically over the top Pacino performance that finally won him the Best Actor Academy Award. Frank is an exaggerated character, and Pacino takes that leeway and runs with it all over New York. Ironically, the best acting happens in the most quiet moments, but it is the bombast that dominates the movie. Chris O'Donnell holds his own and gradually grows into the role of Charlie. O'Donnell finds the uncertainty of a seventeen year old thrust into an early test of adulthood, and while he stays very much in Pacino's shadow, O'Donnell does rise to the few scenes where he finally has to take the initiative rather than react. The supporting cast includes small roles for Gabrielle Anwar as Pacino's tango partner, and Philip Seymour Hoffman as a fellow student at Baird. Trading nuance for impact, Scent Of A Woman fills the room with excessive but still rousing human drama.